If you are planning on starting a new business in China, you have a few different options. If you are a foreign investor, you are likely to look at either starting a Wholly Foreign Owned Enterprise (WFOE) or a representative office. Both of these options have their pros and cons, so it is important that you do your research before you sit down to file the paperwork to create your business. Learning the difference between a WFOE and a representative office is crucial to ensuring that you have created the right type of business. More than half of the companies owned by foreign investors formed in the past few years have been WFOE businesses. If you are starting a business in China, this is one of the easiest options. However, the businesses a WFOE can conduct in China are limited by the government. The first thing you must do is make certain that you meet the requirements. For example, a WFOE cannot be solely engaged in education or in mining. The next step in your WFOE setup in China is to make certain that you have all the documentation required to show that your business is a valid corporation and that you are authorised to make agreements and sign documents on its behalf. You will need to submit a number of documents to the proper authorities in order to create your WFOE, including a copy of your articles of incorporation, your business license(s), a certificate of status, and more. Once you have all the required documents, you may need to have them translated into Chinese before submitting them to the appropriate government agency. To be approved as a company in China, you will also need to write a number of additional documents. These include your articles of association, a feasibility study showing that your business is viable (often including your first year’s budget and a China market entry strategy), a copy of any leases you have signed for office space, a proposed budget including personnel salaries and benefits, and any other documents required. Again, all of these documents will need to be written in or translated into Chinese. Note that this step does involve having your business plan and budget already written and a lease agreement signed. You may need to spend time in China looking at business real estate and negotiating a lease prior to submitting your documents for approval. Once all your documents have been submitted, you will have to wait several months for them to be reviewed and approved. Once you are approved, you will need to pay a number of incorporation fees. These fees may vary depending on several factors, but generally, you will pay about one per cent of the capital you have invested. Note that if your company will be dealing with projects that are large or complex, you may need to negotiate with the authorities to receive approval. Representative offices are considered to be a liaison office rather than a new company located within China. You do not need to have any registered capital to set up one of these companies. However, before you go through the steps required for a China company set up, you do need to make certain that your business does fall within the scope of activities this type of corporation can legally do. Representative offices are limited to doing market research related to the parent company’s business, doing promotion for products and services, engaging in quality control, or functioning as a contact liaison to other businesses in China. Generally, a representative office cannot make any revenue itself or enter into any contracts with Chinese businesses. The steps needed to register as a representative office are similar to those needed to start a WFOE. You will need to find a location for your office and sign a lease, then submit that lease along with the other documents necessary. Unlike a WFOE, however, you can operate a registered office from a virtual office. There are some other differences, too. For example, you must hire employees through a local HR agency instead of directly recruiting them. Representative offices also have different regulations on their finances and banking, invoicing, and different taxes. The Foreign Invested Partnership Enterprise (FIPE) is a fairly new type of business that has been an option since March of 2010. However, it requires at least two different partnership businesses or individuals. An FIPE is also limited in its business scope by the Foreign Investment Industrial Guidance Catalogue. A Joint Venture is another option, but like an FIPE, two different investors must be involved. One of these investors must be a Chinese company, while the other is a foreign investor. A Hong Kong Company is a type of Special Purpose vehicle that investors can use to invest in businesses in China. However, this type of business is not considered a legal entity for purposes in mainland China. It has some major restrictions and pays one of the highest corporate income taxes. 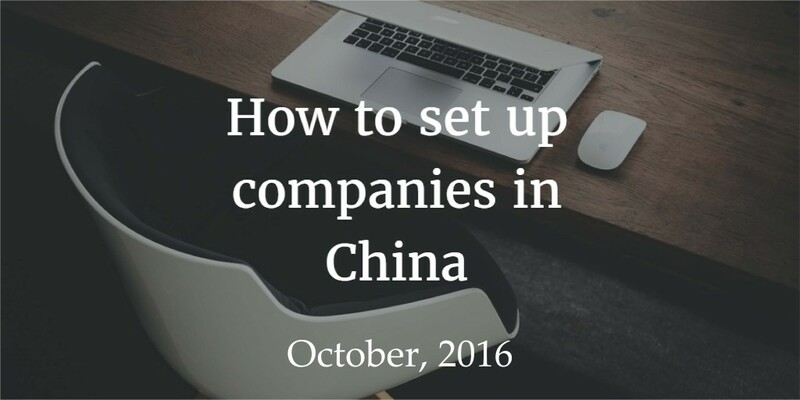 Once you have become a registered corporation in China, there are a few other things you will need to do. You will need to open a China corporate bank account. This is usually fairly simple, especially if you are working with a bank such as HSBC or the Bank of China. You do want to find a bank that has a relationship with a bank in your home country so that it is easier to transfer funds back and forth. When you have completed your corporation’s registration and have your bank account set up, you can move forward as a business. The rest of the steps needed to set up a business in China are fairly normal: you will need to hire staff, begin marketing your products or services if appropriate and start your day-to-day operations. You may also want to hire an accounting firm to take care of your taxes and audits. If you find any of the steps needed to start up your business in China are confusing or that you are stuck somewhere in the registration process, you can find help. When you need assistance with how to set up a business in China you should talk to the experienced experts. Experts such as us can assist you in getting your corporation set up and running.